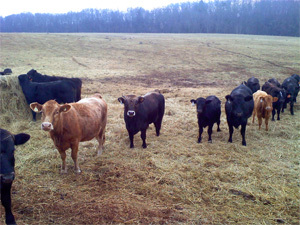 We take great care to raise some of the healthiest and most flavorful beef available today. Located in Fauquier County, Virginia, our beef is locally raised and locally processed according to strict USDA guidelines. Piedmontese cattle have evolved over centuries in a pure environment and are genetically designed to produce low fat, tender beef. The Piedmontese is the only cattle breed known to carry a specific gene that consistently reduces fat and increases the tenderness in the beef. A true full-blood Piedmontese animal will carry two copies of this gene, while a crossbred will carry only one copy of the gene. Here in North America, the Piedmontese influence gives us a choice in our beef fat content levels. One-copy Piedmontese beef will be significantly leaner than traditional beef, while the two-copy Piedmontese beef will be ultra-lean. The American Heart Association recommends 300 mg (or less) of dietary cholesterol per day. One serving of Piedmontese l-copy Beef amounts to 20% of this daily allowance. Nutrient rich, a good source of essential fatty acids, low in saturated fats, calories and cholesterol—but flavorful and tender. Angelic Beef™ raises 1-copy Piedmontese beef, which is high in Omega 3. Thanks to a specific gene — a form of myostatin natural to the Piedmontese breed—you can have all of the natural benefits and flavor of beef that is healthful, low fat, low in cholesterol * and calories, but rich in essential fatty acids & tender every time. We also offer grass-fed beef on request.